Kim Teck was shocked, utterly shocked. There he was, standing in the midst of some thirty or more Boy Scouts and the Troop Leader had just appointed him a patrol leader. He could not believe his ears. He had hardly six months experience as a Boy Scout, and he was made a patrol leader of boys the same age as he. Kim Teck protested saying that he was not qualified for the role, but the Troop Leader and the Scoutmaster voiced their confidence. Finally, Kim Teck had to accept the appointment, although he doubted his ability. Soon Kim Teck had seven boys under his command. He chose Arul as his assistant. The other members of his patrol were all from the same form in school, and some of them were his classmates. They were friends and no one gave anyone orders. Now as the patrol leader, Kim Teck had to give orders to his friends. It was not something he relished, but it was inevitable. So began a new phase in Kim Teck’s life. In subsequent scout meetings and camps, he learned what it was like to be a leader. There were times when he had to make difficult decisions and give unpleasant orders to his charges but he managed to do them with the minimum of fuss. Once, at a weekend camp, Arshad, a member of his patrol, accidentally stepped into a hole and broke his ankle. At that time, he was looking for firewood outside the camping area with Meng Lee. Arshad could not walk and Meng Lee had to rush back to camp to inform Kim Teck. Kim Teck and the rest of the patrol hurried to where Arshad lay beside a tree. Arshad was in considerable pain Working quickly Kim Teck put a splint onto Arshad’s ankle to immobilize it. He gave orders to the others to make a stretcher. The scout training they had had was really useful Soon they had Arshad comfortably on the stretcher and headed towards camp. When they reached camp, they informed the Scoutmaster who then called an ambulance from his handphone. Before long Arshad was on his way to the hospital. The Scoutmaster praised Kim Teck and his Lion Patrol for handling the emergency well. What they had done was really commendable. Six weeks later, Arshad returned to active duty. Everyone was pleased to see him well again. Kim Teck, for one, was glad that he played his part competently. He had learned something about the responsibility of being a leader. Once upon a time, there lived a crab in the sea. I am so bored of living in the sea. I think the meadow behind the beach is a better place for me to be. I will move there. And so, the crab came out the water and made its way beyond the beach, And into the meadow. Ah, this is life. I wonder why I didn’t do this earlier. 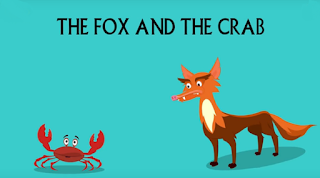 Unknown to the crab, a fox had been watching him since the moment he came into the meadow. And one day, when he found the right moment, he attacked him. I have been waiting for this moment. I will eat you now. The crab tried to hide but it didn’t know how to. Not on land anyway, he was not familiar with the terrain at all! It’s my fault! I should have stayed in the seas and the beach where I belong and know how to protect myself. Well, Yes. But now it’s too late for you. 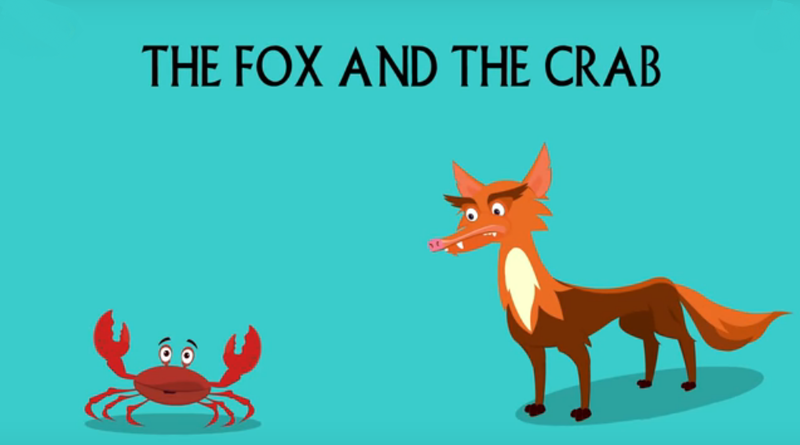 Saying so, the fox quickly ate the crab and ended his life. Once upon a time, there lived a huge elephant in a jungle. Because he was so much bigger than all the other animals he always troubled them. In the same jungle, there lived a family of ants. They were a hard work working family who always kept to themselves. In the day they would go to gather food. One day they as they were going the big elephant threw water on them. Hey! What’s the matter with you? Why do you keep troubling others? Oh, shut up, you tiny ant! One more word out of you and I will walk over all of you and kill you. The little ant had no choice. It kept quiet and went on its way. You shouldn’t pick a fight with the elephant. He is very ill-tempered and very very strong. He could crush you. Hmm…something needs to be done about it. The next day when the ants were going to work, the tiny ant decided to teach the elephant a lesson. She quietly climbed on to the elephant and made its way to the elephant’s trunk and entered it. Once inside, she started biting the elephant. Aaah! That hurts! 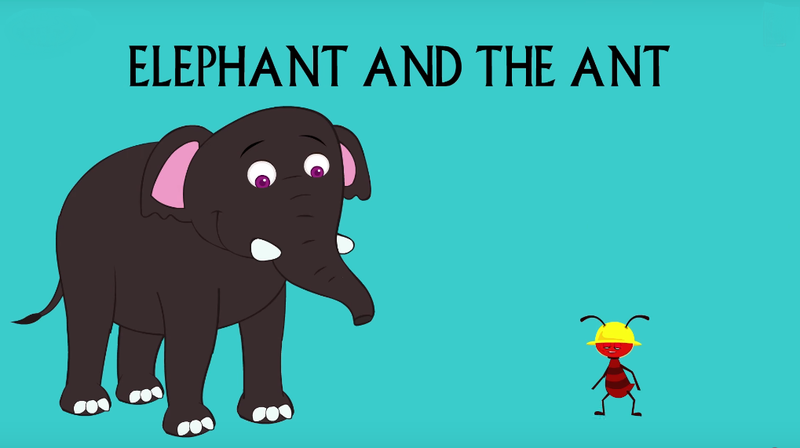 the elephant tried everything but it couldn’t get the ant to stop biting him or come out of its trunk. Such a big elephant became useless in front of the tiny ant. Please stop! Aaaah! Stop it now. Well, I hope now you know how others feel when you hurt them. Yes, I do! Please, please stop now. 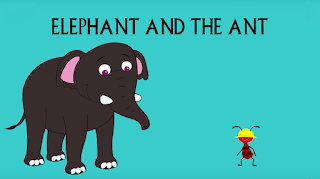 Very well, then and so the ant stopped biting the elephant and came out its trunk. I am sorry. I have understood how bad I made others feel. I promise I will never ever do it again. Sumiti was a young girl. Her mother worked in a bank and her father was a doctor. Her parents love her very much. Sumiti always got whatever she asks for. Whenever her parents went to the market, they got beautiful gifts for her. She was quite a pampered child. Sumiti was a bright student. She was good in her studies. She did her work neatly and was always polite and helpful to everybody. But her teachers did feel that Sumiti was a little pampered she always managed to get whatever she liked. If she happened to like somebody’s pencil, she was quick to give one of her own things to get a pencil. But one day the Sumiti realize her mistake. She learned to be happy with whatever she had. It so happened that one morning when Sumiti entered the class, all the children were gathered around Tina. Everybody was admiring her new pen. Sumiti also saw the pen. It looked beautiful. She wrote her name with it. The pen was excellent. As the children were admiring the pen, the bell Rang and everybody rushed downstairs, for the Assembly. While the children were making those lines for the Assembly, their teacher called Sumiti and asked her to bring some chalk from the classroom. 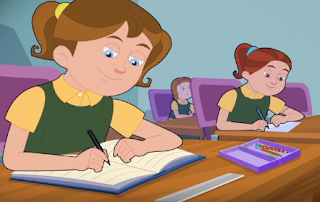 When Sumiti entered the class, she could not stop herself from peeping into Tina’s bag. She took out the pen to see them once more. She wanted that pen badly. Just then she heard footsteps. In a hurry, she quickly put the pen in her pocket. Turning around, she saw Vibha entering the class. She has come back because she was not feeling well. Sumiti ran out with the chalk pieces in her hand and pen in her pocket. After the Assembly with everybody settled down, Tina started searching for her pen. She told the class teacher that her pen was missing. Miss Ali wanted to know who was in the class during the Assembly. Vibha was called. Miss Ali searched her bag but could not find the pen. She scolded Vibha for stealing. Poor Vibha! She started crying. Sumiti was too afraid to get up and give the pen to Tina. Miss Ali gave Vibha a day’s time, to tell the truth. Now Sumiti was a very sensitive child. 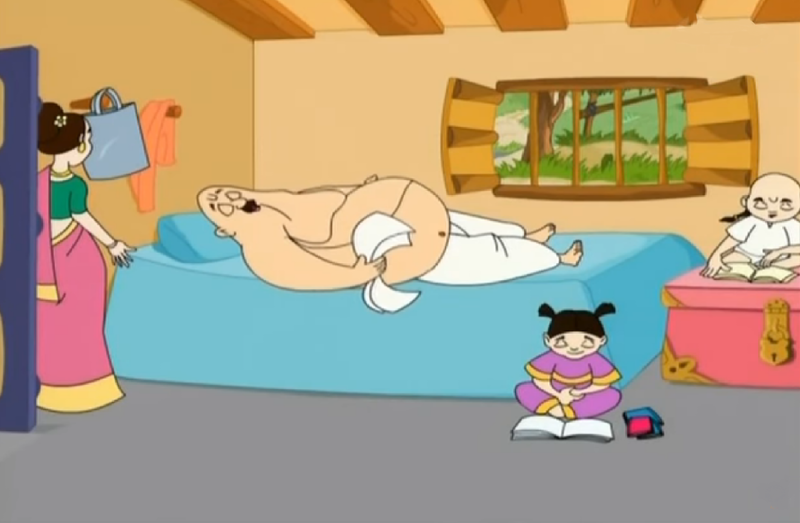 She spent the night tossing and turning in bed. She could not sleep. The pen was still hidden under the pillow. She looked at it again for the hundred times! The pen no longer looked beautiful to her. She could not forget Vibha’s face when Miss Ali had accused her. She felt bad. Vibha had been scolded for no fault of hers. She decided that she would keep the pen back in Tina’s back next morning. Next day, when Sumiti reached school, she saw Vibha along in the class. She was very sad. Don’t worry. Maybe somebody will keep the pen back today,” she tried to comfort Vibha. But everybody will think that I have kept it back,” Vibha replied sadly. The bell Rang and the school started. When Miss Ali entered the class, she called me Vibha. Before Vibha could get up, Sumiti got up. Miss, the pen is with me. I was looking at it yesterday when suddenly Vibha entered the class and without thinking, I put it in my pocket. I was afraid to tell you when you were scolding Vibha. I am very sorry I will never do it again.” everybody was surprised. Miss Ali was the first one to speak. “Sumiti you are a brave and honest girl you have told the truth in front of the class. We all make mistakes but we are always afraid to admit them. Say sorry to Vibha. SORRY VIBHA! It was because of you that she was scolded. Which she was scolded and make a promise that you will never do something like this again.” saying this, she asked the class to take out their books. Everybody was happy once again. Sumiti had learned her lesson. One day a horse saw a snail in the meadow. Look at you! You are so slow! Hmm. 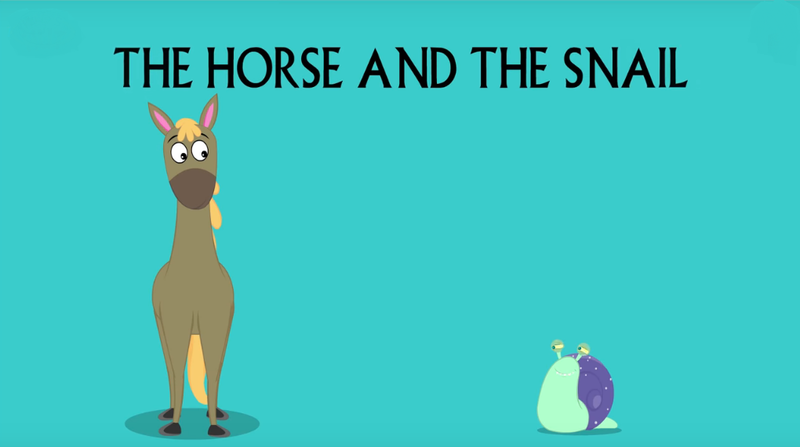 The snail did not like the way the horse spoke to him. But he decided to ignore his mean comments. But the horse went on and on where are you going? And when do you think you’ll reach there? I didn’t understand why you need to make fun of me all the time? Well, look at yourself! It takes you so long to get from one place to another. I would run miles at that time. I suggest we both get on with our businesses and day. You know, I have an idea. Let’s race! The snail thought about it for a moment. He had a plan. Okay, sure! Let’s do that. How about this Sunday morning? Okay. We will race this Sunday. 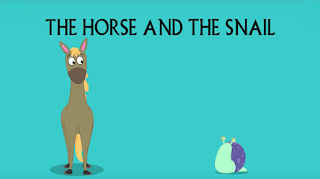 After the horse had left, the snail gathered all the other snails and told them what had happened. He also told them his plans. Everybody agreed and when Sunday came. They met very early in the morning. How did you get here? I must run faster. And so, the horse started running. After some time he looked down and yet again saw a snail ahead of him. How is this possible? How can you be ahead of me? I run ever faster. The horse started running even faster. When he looked down again after some time, he saw the snail there again. This is impossible! I will run the fastest, I can! Now the horse took off as das as he could. As he neared the finishing line, he looked down. But he saw a snail crossing the finishing line! Tired and humbled the horse gave up. I am so sorry. I underestimated you and made fun of you. Please forgive me for my arrogance. All the snails who had hidden along the race course and fooled the horse into believing. That they were the same snails he was racing heard this and laughed quietly from their hiding spots! 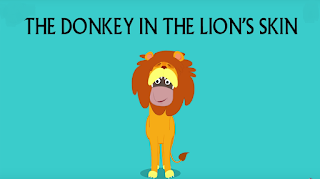 One day a donkey found lion’s skin. Oh look it’s the lion’s skin. Let me put it on. He put it on and looked at his reflection in the river. Wow! I look just like a lion! No one can say that it is me. I must take advantage of this. The donkey wore the skin and marched into the village. Obviously, seeing a lion in the village, the villagers got scared and started running helter-skelter. They left their stories and kiosks open. The women dropped baskets full of hay and fruits on the road. Grabbed their children and locked them indoors. This is so much fun! The villagers have left their food and belonging out here in the open for me to feast on. The donkey ate much as he wanted to grab his loot and went back into the jungle. For the next few days, he relaxed and enjoy what he had brought from the village. When his supply ran out wearing the lion skin, he walked into the village once again. The villagers once again ran at the sight of the lion and the donkey gathers his loot. This went on for many days. Every time he was successful. The donkey’s confidence grew. We must do something about this lion. What can we do? Let us follow him and see where he goes. And so, the villagers decided to follow what they brought was the lion. 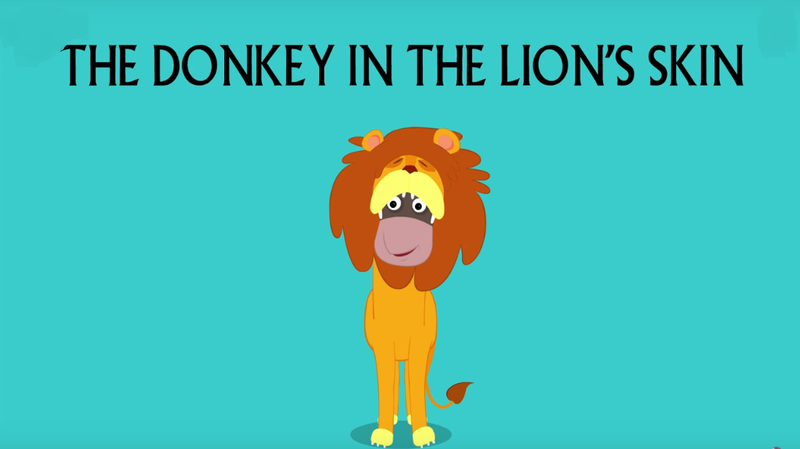 The donkey was particularly happy that day after plundering the village, still wearing the lion skin. He went straight to the wheat fields and started singing loudly. The villagers who were behind him recognized his braying. It is not a lion. It is a donkey! Braying in a lion’s skin. I say we teach him a lesson. The villages caught of the donkey and beat him mercilessly. Long long ago they lived a Brahmin in a little village. We had everything that he needed. he had a good wife. Intelligent children, he even had fertile land in which he could grow anything he wanted but he was very daisy and he’ll ever be worked. His wife tried in vain to make him poor on his duties. Wake up its morning funny aren’t you going to the field? Me you must be crazy I shall never work, his wife was very upset. But she could not do anything about it. One day a hermit came to the Brahmins I see the Brahmin was very kinds and generous to the harlot. Please, the Hermit told the Brahmin, son. I am very pleased with your service to ask me for a wish and I shall make it come true the Brahmin was very happy he immediately said noble wine. I wish I had someone who could do my entire world. The Hermit agreed so ate but remember you must have enough work to keep him busy. The Brahmin agreed and lo beholds a great demon stood before him. Master, what should I do? The Brahmin got yes if I don’t have well. I shall eat you. Slightly surprised the Brahmin passed the demon to go and water the Bligh’s. The demon left in a flash but remember you must have enough work to keep him busy. Pleased the Brahmin sat down and asked his wife for a glass of water. But before he could drink it the demon returned. What do I do next? The shocked Brahmin dropped a glass of water from his hands. Okay, you may rest now. We can do the rest of the work tomorrow. No, Master! I won’t work now. If I don’t have one, I shall eat you! The Brahmin was terrified. Why don’t you plow the fear then that should take you all night? Tomorrow I shall give you some more work. The demon agreed and left. Pleased with himself the Brahmin sat down for dinner; see my dear now all my work will get and I don’t have to anything. Hearing the Brahmin’s wife just smiled just as he was about to eat the first muscle the demon returned! Now the Brahmin was scared he wondered if they had enough work for the demon seeing this his wife said dear can give him some work. You! Yes. What work is there to do? Don’t worry I’ll tell him. Okay, go out make out talk Multi strand straight. The demon just grunted and set out once again. See how dangerous laziness can be. You try to avoid your own work and that this demon is there to help you. He says he will kill you if there is no work. You’re right I am so scared. What would we ask him to do after? He strengthens all air the Brahmin wife laughed. Don’t worry my dear that’s why I gave him that work. Ha-ha, that demon will never be able to straighten morphed. Stain, sure enough, the demon did not successes in this big task still straightened when he pulled it but called again if he left it. Why don’t rest after dinner and promise me you will work hard from tomorrow. I promise! Thus leaving the demon to his difficult task the Brahmin and his wife went to sleep. The next day when the Brahmin readied himself to leave for the farms the demon was still trying to straighten up his tail. How are you doing demon? Our vignette Sumatra hurry up and finish your task! I have more work for you. Having said the Brahmin set out his field he was never lazy again. 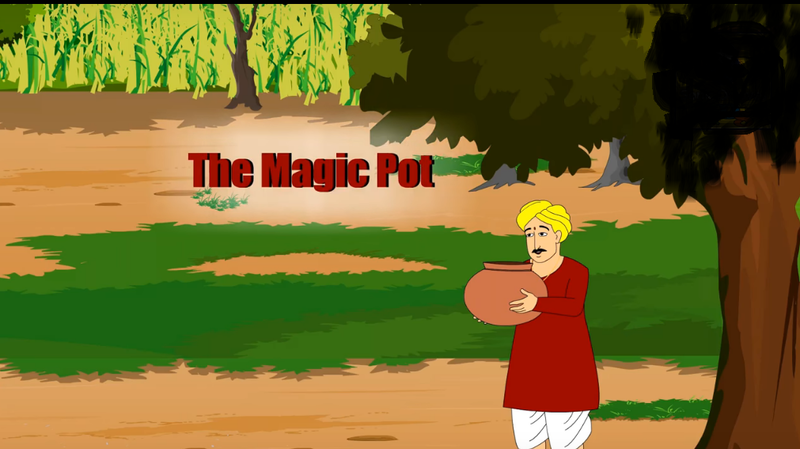 The name of the story is the Magic Pot. Once upon a time, there lived a farmer in a village. He uses to go to his farm daily and do his farming activities. One day he was digging the farm to prepare it for sowing the seeds for coming monsoon. All of a sudden, he found a big Pot on the farm he took the pot out and he wondered what that pot will be useful for. So he just kept that pot aside and started his activities again. During the lunchtime, he just kept his spade in the pot while he was eating when the farmer finished his lunch. He saw to his surprise that his spade was multiplied to 100 spades in the pot. He was really really surprised. He thought to himself. Oh! I did not bring 100 spades. I just bought 1 spade. How come 1 spade becomes 100 spades? I don’t understand. Then he thought, this must be something to do with the pot. So he took away those 100 spades and took up a stone from nearby and put that stone in the pot and then when he looked inside the pot instead of that single stone there were 100 stones in the pot. That is when he realized that the pot was magical. So he brought the pot back home and kept it in the seal from that day on he used the pot to satisfy his needs. So whenever he wanted a cloth he would put a piece of cloth. And he will get enough of cloth for him to make his clothes. Whenever he was hungry he would put a fruit in that pot and he would get 100 fruits back from the pot. That way gradually he started becoming rich. But the farmer was very honest. He never used the magic of the pot for satisfying his greed. He was not a greedy farmer! However, his neighbor noticed that this farmer is getting richer and richer every day. So he tried to find out the secret of his richness. So one day his neighbor stood outside his window peeping into the house of the farmer to find out what this farmer is doing. That time, farmer kept a little spoon of milk inside the pot and he took out a liter of milk from the pot. Hmmm! Now I understand, said the neighbor. 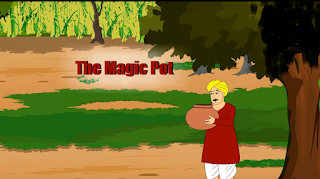 He said that the magical pot giving him all the richness. So this wicked neighbor envious neighbor decided to steal this pot from the farmer. That night itself, he stole that pot from the farmer house and took back it home to his house. He was very eager to find out the magic of the pot. But before that, he wanted to find out if there is anything inside the pot. So he put his hand in the pot but obviously there was nothing in the pot. But to his surprise when he took out his hand he realized that now he has 100 hands on his body. And now he was really scared because he did not know to bring those 100 things back to 1 again. So next day he has come out of his house the people were really scared and they thought that he is some kind of demon with 100 hands on one side and one hand no other so the other villager started stoning him and they drove him away. When the farmer saw all this happening that the neighbor must have stolen the pot from him and must have put in his hand into it. So the moral of the story is Do not be envious of anyone and never steal a thing from anyone. The following is the beginning of the story. Complete it in your own words. There was a boy who hailed an obscure background. But he was brilliant, diligent, and innovative. He was very helpful to educate the street children. So, he started to teach children how to read and write. No one helped him in his endeavor. So, manage books, pencils, pens, board, and some other necessary things at his own expense. Children came to the roof of the building he lives in. one day, a reporter from a renewed TV channel came to make a report about his school. When the report was telecast on the TV, thousands of people watched it. The school started to get donations from various people, ranging from rich to poor. One day a famous actor gave him a huge donation. He started a foundation for the poor children. He took the help from professionals and built an institute for the street children. Soon it became a leading educator in the state that offered free education, treatment, and accommodation for the street children. His name and fame spread far and wide. He got a number of national and international awards. The success made him more courageous. He started another project for the disabled. Once a golden necklace was lost from a rich man’s house. A few servants worked in that house…………………. Once a golden necklace was lost from a rich man’s house. A few servants worked in that house. Naturally It was suspected that any one of the servants had stolen the necklace. The rich man asked all of them but they did not confess their guilt. So the master complained to a judge. The judge was very wise. He called all the servants but they denied the charge. Then the judge hit upon a plan to detect the real thief. He gave each of them a stick of the same length and told them to submit the sticks the following day. He told them that the stick of the real thief would increase by an inch. Returning home, all the servants kept their sticks as they were except the servant who stole the necklace. He shortened his stick by an inch. The next day when all submitted their sticks before the judge the real thief was easily detected. Then the thief was given his due punishment.